This place looks just like Northern California. Away from India's hot arid plains and over populated cities are the great Himalayas, outfitted with all the elements that make a visit to the mountains so irresistible. Raging white water rivers, Christmas tree perfect pines and snow capped peaks in every direction. If Yosemite had a sister National Park, it would be right here in Northern India. 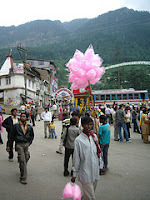 And it's among this backdrop, seventeen hours by bus from Delhi, that the town of Manali sits. The once peaceful hideaway was first discovered by hipster backpackers in the 1960's who were looking for a quiet place to get high. To the Hindu Indians, it is a much more sacred place, as this is the spot where Manu, Hinduism's Noah, alighted his boat in order to re-create life after a great flood destroyed the earth. 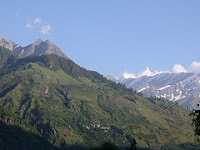 Today, Manali is a bonafide resort town, luring Indian's away the rush of the city and backpackers away from the smells and beeping horns of the city. But while this place looks like Northern California, it feels just like Gatlinburg, Tennessee. It's really quite odd when you think about how two towns, on opposite sides of the world, could resemble each other so closely. 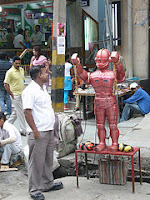 Both tourist traps embrace endless (and grossly overpriced) souvenir shops, numerous junk food stalls, on the spot cultural shows and other symbols of bad taste. What's even more bizarre is that two separate groups of tourist, with completely different backgrounds, could both enjoy buying tacky trinkets like wooden boats that read "Manu was here." It's like there's an unwritten rule between cultures to find the most beautiful mountain valley around and then build the cheesiest town possible right next door. (I guess if we're afraid to actually go 'into the woods' we have to somehow occupy ourselves while we look at them.) And yet, I have to admit, for all it's circus like atmosphere, it still manages to hold some charm. And so this is where we've been spending our days. When we're not roaming the countryside, we're fighting off the urge to buy cotton candy and walking through crowds of happy tourists who are proudly filming their kids buying wooden boats. Really, the only thing this town is missing is a Ripley's Believe It or Not Museum. This doesn't sound like the India I remember. Different area or things have changed. KD - I'll guess what that means!! Gwen - Yea, I didn't mention the flies or the trash or the heat. :) But this is Northern India...nestled between China and Pakistan...few India visitors get up here because it's only really open for the summer. Missing you guys. I think of you often and I'm always glad you're doing what you're doing. Keep soaking it up. Looks like a good family destination! Can't wait to hear more about your trip!